Please call Dave at 919-691-four seven two five. Boat is located in Nashville, North Carolina. 2003 High Torque Marine SS-24, 2003 High Torque Marine 24-SS closed bow. 900+ hp 578ci Big block bow tie gm block ,Has small pulley on blown, inter-cooled big block Chevy motor, BDS blower, 750 Holleys freshly rebuilt , polished and ported Brodix aluminum heads, all forged internals and ARP bolts throughout, Lightning headers, MSD ignition set to rev limiter at 5800 rpms , IMCO twin ram hydraulic steering, Teague lower unit, and internals. 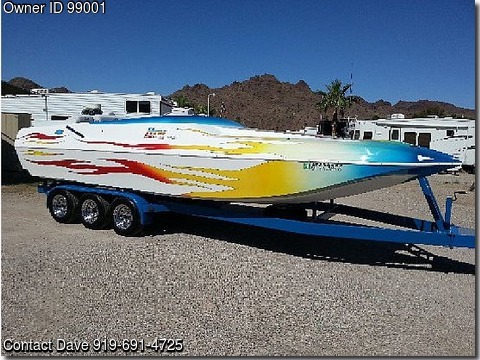 This boat has a custom gel coat with incredible fades. Interior is in fantastic condition; gel coat is beautiful! Tunnel interior has vinyl and tweed. Matching trailer with breakaway tongue, full LED lighting, disc brakes and newer tires. Hull has 150 hours and approximately 50 on motor.Beautiful boat, in excellent condition. Also for sale:2008 5th wheel toy hauler By Crossroads 36’ds – $32,500.